You’ve probably seen many contests out there. Some writers hold a contest on their website every month. I’ve held a few contests before, offering various things as prizes. But as I was thinking about what to do for the launch of “Flawless” I started to wonder what was the best way to run a contest? And what are the kinds of prizes that draw readers to your website and entice them to buy your book? Yikes! Good to know, Courtney. The funny thing is I was just reading some information on a promotional site and they were urging authors to set up that kind of contest. State what the prize is upfront. You can’t just say that it’s a surprise package. If you are giving away a book, give the name of the book. I suggest that you also state the book’s format (hardcover, paperback, ebook download) so the person entering the contest knows what to expect. Don’t make it too hard to enter. If your entry requirement states that the reader must give the name of an obscure character, the reader may not bother entering. And if she can only get the answer by buying the book, Courtney says we’re in a gray area, legally speaking. You should not require a person to buy something in order to enter the contest. The best practice is for the answers to be somewhere on your website, usually in the excerpt for that book. Courtney also states that to avoid problems, it is wise for the American author to limit participation to U.S. residents. Since I am Canadian, I will have to leave that advice to my American friends. I scooted around on the net and looked at several authors’ contest pages. As an example here’s Historical author Kathryn Caskie’s contest page. The page is attractive and Kathryn makes it easy to enter. She gives a link so that the answer can be easily found and states that her books are readily available in libraries if someone wants to look up the answer there without having to buy the book. The prize is shown and the times of the draws are also listed. One other thing that Ms. Caskie does is to state that by entering in her contest the reader is also signing up for her free newsletter. Since getting the word out about your books is the whole purpose of holding a contest, and a newsletter is a great way of connecting with readers, this is a great idea. But she makes sure she tells people what she’s doing upfront. Sometimes authors can band together to hold a contest. Author P.L. Parker says “I think the ones where it’s sort a scavenger hunt and each day another author has a clue to the next blog spot. They’re fun for everyone and get a lot of hits.” She also says that the ones with a holiday theme do especially well. What kind of prize should an author give? Perhaps it depends if you are targeting readers or writers. I once entered a contest at C.J. Lyons’ website where the prize was a critique of a query letter, 2 page synopsis and first three chapters by an agent. My focus is on getting readers to know me. I have given away jewelry and chocolates, but I think books make the best prizes. Author Beth Trissel agrees. “For me, it (the best prize) has to be where the prize is a signed book or books. People do like those signed author copies.” If the purpose of my contest is to introduce new readers to me and my work, then it makes sense to offer my books as prizes. I can only hope that having read one of books, a prize winner will come back for more. Have you ever entered an author’s contest? What enticed you to enter? Do you think contests get readers to buy an author’s books? In a move of shameless self-promotion, I will tell you that I have a contest running at my website to celebrate the release of “Flawless”. I’m offering several of my books as prizes. The contest ends February 28 so I hope you’ll drop by and enter soon! As I mentioned a couple of weeks ago, I just concluded a busy month of January. I needed to complete revisions on a manuscript by the end of January to have any hope of selling it to my publisher. The tight deadline meant there wasn’t time to have writing friends read it over and offer suggestions before returning it to my editor, which is what I normally like to do. My editor made a lot of suggestions and pointed out where things worked and where they didn’t. My job was to figure out how to fix the things that didn’t work. I struggled with the changes and barely finished before month’s end. With great trepidation, I sent “The Girl Most Likely” back to my editor. I had no idea what to expect. To my great surprise and delight, she liked the changes I’d made and offered me a contract. What a relief! But to me, the greatest surprise was that aside from the help I received from my editor, I was able to complete the revisions my own. I know that sounds strange. Writing is, after all, a very solitary pursuit. We're supposed to do this on our own. But I’ve relied a lot on critique partners and writing friends for advice. And I’ve received so much solid help over the years, to the point where I sometimes wondered if I could write a book on my own. I honestly don’t think I could have been published without a little help from my friends. But this past month has taught me that I can trust the voice in my head, the one I too often ignore, the one that says things like ‘This section doesn’t work’ or ‘She needs more motivation for her actions’. In a lot of cases, if something isn’t working, I actually do recognize it, and if I listen hard enough I can figure out what to do to fix it. Going it alone can be scary. And confusing. I’ve been in the situation (many times) where my story can go in one of several directions. Which way do I turn? What is my story about, really? How do I get my message across to readers? It’s comforting, not to mention confidence building, to know the answers are inside me if I look hard enough. It’s good to know that after all these years I’m finally starting to trust myself as a writer. So does that mean I no longer need a critique partner or a writer’s group? Hardly. I probably need them more than ever. I’ll always need people to bounce ideas off of, and to give me honest feedback. There are going to be times when I’m stuck and don’t know what to do. And you can’t have too many friends in this business. But at least now if I have to go it alone, it won’t be quite so scary. 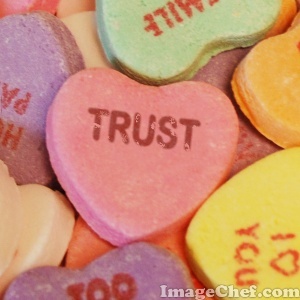 Have you learned to trust your voice? Thank you for having me on your wonderful blog Jana! For those of you who don’t know me, let me introduce myself first. I’m LaVerne Clark and a newbie writer. Well – that’s not strictly true. I’m a member of Romance Writers of New Zealand and have been writing for years, always with the thought of being published ‘some day’. Luckily for me, The Wild Rose Press turned my ‘some day’ into November 2, 2010 – a date forever etched into my memory and heart. Guardian of the Jewel was also my very first submission to any publishing house and I credit the success of the story to a large dose of ignorance. Ignorance is a vital weapon in the arsenal of the newbie writer. How many of us would persevere if we knew what we were writing were clumsy and clichéd? Sure, those thoughts invade our minds, battering relentlessly at our ego’s defences, but because we don’t really know for sure, we battle on regardless, and if we’re stubborn enough, finish the prose our hearts dictate we write. Ignorance also shelters you from the tough road of editing – that intensely important roadblock on the journey that forces you to sit down and strip back your masterpiece to the bare bones. Although it can be painful, it will reward you with a story that shines brighter than you ever imagined. Just when you think that is it – your book is ready to fly off the shelves and find a loving home with a large audience – you’re faced with that last ugly and necessary step – Promotion. Promotion! What is that? For us writers, the very idea is abhorrent. What do we know about promotion – and you mean we have to advertise ourselves – in public? It’s enough to make you run for the hills screaming in terror. But you know what? It’s actually kinda fun. The writing world is inhabited by the most amazing people, keen to help you out every step of the way. Even though I live half-way around the world in New Zealand, the internet allows me to meet and become friends with all kinds of fascinating people. And I wouldn’t be here today talking to all you lovely folk without that dreaded step. It’s true what they say – Ignorance really is bliss. Embrace it – and good luck with all your own endeavours! After coming to terms with the brutal death of her husband by unknown thugs half a world away from New Zealand, Amy Hamblin concentrates on bringing up their son alone, struggling to make their dream of an action-adventure tourism venture a success. Gabriel Ryan’s task of finding the priceless blue diamond Amy’s husband stole from an organised crime ring, is made all the more difficult by the attraction that sizzles between them. Playing a role had never been so hard, and now, with a ruthless killer on the trail of the missing jewel as well, he needed all his wits about him to keep them all alive. Gabriel’s knee pressed into Amy’s thigh and sent unexpected frissons of longing to race through her system. The thin material of her jodhpurs weren’t any barrier to his heat. She scrambled to regain her composure and urged Pippin away, fixing her concentration on the path ahead. “It’s not nearly enough for a woman like you,” he murmured, his changeable eyes darkened to molten steel and raked over her in thorough appraisal. Her shaky resolve melted away under the heat. Unable to take a breath, let alone speak, Amy lifted her hand and gave the signal to ride single file. As she trotted ahead, the unmistakable sound of soft laughter followed her. He recognized she was running away and the knowledge he was right made her face flame all the more. January 25, 2011 - I visited with Joanna Aislinn at her lovely blog and talked about getting to know my characters. February 2, 2011 - I talked with Liana Laverentz about writers and back pain. On February 7, 2011 I will be visiting New Zealand (virtually, anyway) to be on Laverne Clark's blog. Laverne, who is also part of the Jewels of the Night series, interviewed me about the process of writing "Flawless", and what it's like to write for a series. Laverne Clark will be making a visit to my blog on February 10 to talk about The Power of Ignorance. It seems that ignorance can be bliss when it comes to writing. On February 12 I'm participating in Long and Short Reviews Valentine Blog Party. I have three blogs appearing on http://lasrguest.blogspot.com/ about where ideas come from and the thought processes that went into writing my books.I call these blogs "Behind the Book". I also have a blog appearing on their Goddess Fish blog (http://goddessfishparty.blogspot.com/). This blog is all about the first kiss that Hunter and Madeleine share in "Flawless" along with an excerpt. It's called "Oh, that First Sweet Kiss!". There are fantastic prizes up for grabs at LASR (a Nook, a Kindle and lots of Gift Certificates) and all you have to do to enter is to comment on any of the many blogs. I hope you'll stop by and comment on my blogs. 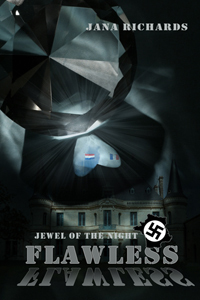 And lastly, at least for now, I'm guesting again at http://lasrguest.blogspot.com/ to talk about my interest in the events of World War Two and the inspiration for writing "Flawless". And please don't forget that I have my own contest running on my website at http://www.janarichards.net/ Just click on 'Contests'. I've got copies of my books as prizes and it's easy to enter. Good luck! I hope you can check out some of these events! Thanks! I made a boo-boo in my scheduling. This blog was supposed appear yesterday but instead I managed to post it for March 3. Oh well, better late than never. January flew by for me. “Flawless” was released by The Wild Rose Press on January 5, so I’ve been busy writing posts for guest blogs and lining up different places to promote the book. In December I completed work on another novella, called “The Girl Most Likely” which I also submitted to The Wild Rose Press. I heard back just after Christmas that it wasn’t accepted, but it wasn’t outright rejected either. The editor gave me the opportunity to revise and resubmit by February 1. So I spent most of January doing just that. I had wanted to start a new project for Book in a Week (BIAW), the event my writing group, the Saskatchewan Romance Writers, holds every January, but with all the revising and blogging, it just didn’t happen. It’s been a whirlwind, exhausting month, and I’ve just now come up for air. I discovered that while I was in the trenches writing, my house went to hell-in-a-handbasket in the clean department. When I’m done writing this, I’m going to clean toilets. There’s always Plan B – I was disappointed that I never got to start a new project during my writing group’s BIAW this January. But I’ve already decided to clear the decks for a week in March to have my own little Book in a Week retreat. I’m excited about it already! I need to take care of myself – One of my worries this past month was getting sick with the flu like so many of my colleagues and friends have this winter. I didn’t have time to be sick! So I tried to look after myself. I washed my hands—a lot. Though tempted, I rarely stayed up late, even on weekends. I started taking a multi-vitamin and I’m really trying to watch what I eat (with varying degrees of success). I walk the dog every day and I didn't miss a Pilates or yoga class in January. I managed to stay flu-free through January. Hopefully, the rest of my winter will be healthy, too. Develop a can-do attitude – Though it was daunting, and a little disheartening, to be faced with major rewrites, I tried to approach them with the attitude of making my work better. Being angry about my near-rejection wouldn’t make the writing go any better, and giving up wasn’t an option if I wanted any hope of a sale. So I tried to take the editor’s comments to heart and told myself ‘I can do it’. I got a major boost from Janet’s Journal and a link that she posted there for a blog by Roxanne St. Clair entitled “No Excuses”. Stop and smell the flowers – I am very lucky to have the opportunity to do what I love to do. Writing takes an enormous amount of time and effort. If my husband didn’t support me, both financially and emotionally, I couldn’t do this. If I didn’t have writing friends and other friends who supported me, I couldn’t do this. I have my health; the recent health problems of a couple of my friends has taught me how precious a gift it is. I have to remember to be thankful for everything I’ve been given, even when the writing gets tough. When I get bitchy because a scene isn’t working right, or somebody gets a contract and I didn’t, or another writer is making better sales than I am, I hope I can remember that in the vast scheme of things, I’m doing okay. So what did you learn over the month of January 2011? What are you most grateful for? I hope you can join me on Monday when I'll be blogging at fellow "Jewels of the Night" author Laverne Clark's blog. I'll be talking about my experience writing "Flawless" and what it's like to write for a series. Lou next to a snowbank on our driveway. The snowbank is much bigger since this picture was taken last week! The spruce in my front yard is burdened with snow. This is the trail where Lou and I often walk. The trees were covered in hoarfrost this day. The poor little scrub beside the step is buried. My street on a snowy day. ﻿﻿ Please join me tomorrow at Liana Laverentz's blog http://lianalaverentz.blogspot.com/ I'll be talking about writers and backpain.